When traveling along the N4 from Sligo Town toward Dublin, six kilometres from the village of Collooney in Co. Sligo lies a less than noteworthy junction named Lackagh. Here by the roadside you will find a collection of disused buildings including the shell of a former pub/dance-hall, and a run-down old petrol station with the dial on the pump firmly rusted at 50p per litre for petrol. 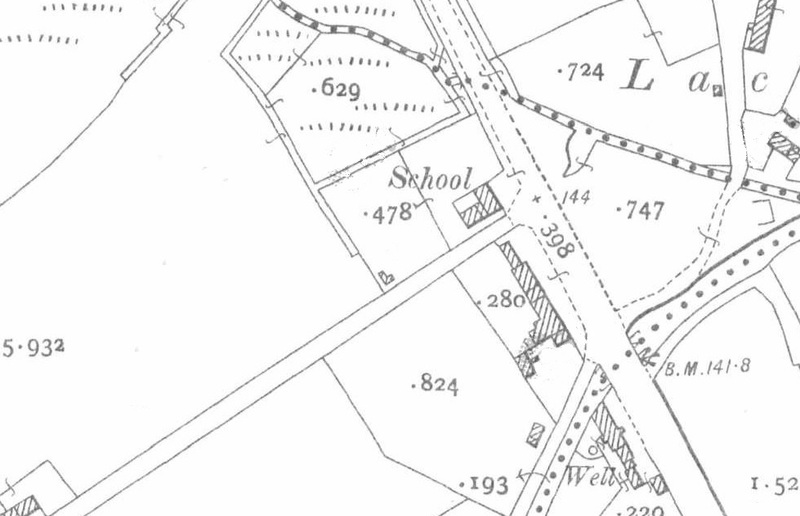 If you look a little closer, hidden behind the roadside undergrowth on the western side of the road is the dilapidated remains of a school house marked on the Second Edition Ordnance Survey Sheet for the area. From the road, the rusty red colour of the more modern sheet-iron roof can be identified hiding behind the shrubbery. In fact, both the school house and what is most likely a school master’s house still survive, though both in a poor state of preservation. Inside the single-roomed, single storey school house there is little to indicate the buildings former purpose, with what is clearly a sizable domestic open fireplace located in the south-eastern gable being the only feature of note. In all likelihood, the building served as a homestead for some period after it’s use as a school. Six sliding sash windows once allowed light into this place of learning, though partial collapse of the walls means that two of the six are now destroyed along with the doorway. If it were not for the Second Edition Ordnance Survey Sheet recording this place as a school house, there would be little within the interior of the building to indicate it’s former purpose besides it’s open plan. It is certainly one of the smallest school buildings I have visited measuring just 7.5 m x 3.5 m internally. 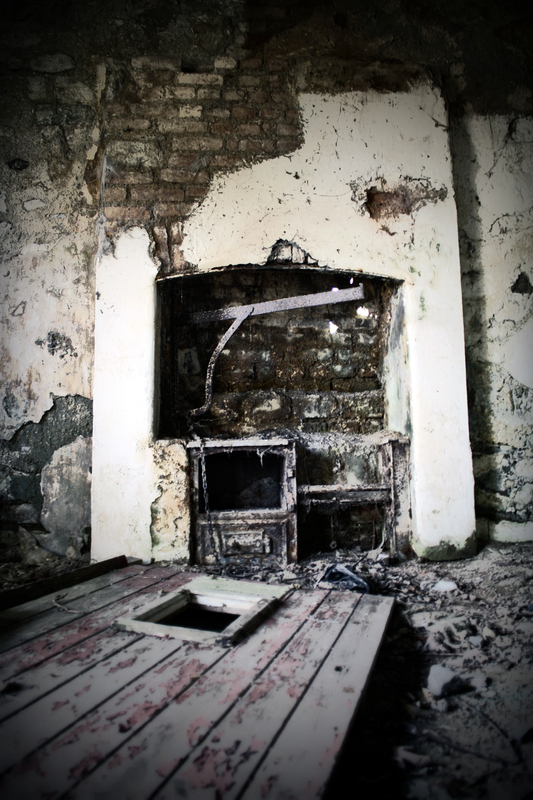 The presence of the large domestic fireplace (probably a later addition) further disguises the buildings original use. Lying immediately adjacent and to the southwest of the school house is what is most likely a former school master’s quarters. 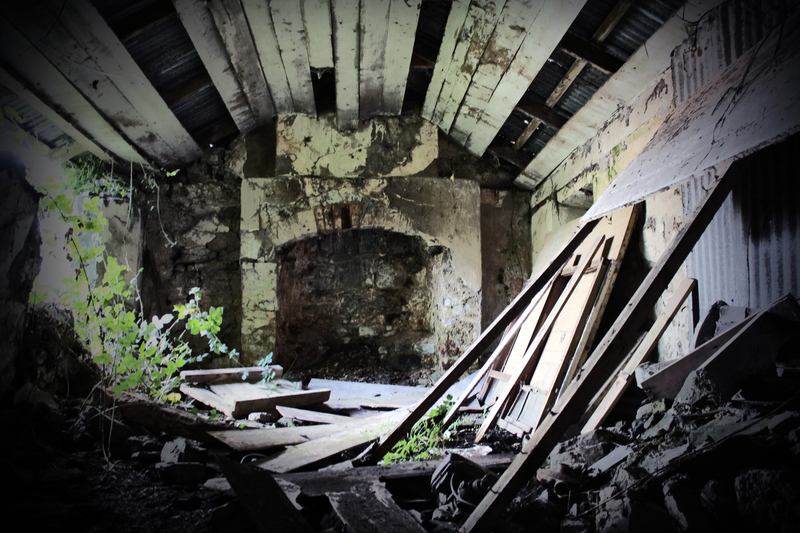 Measuring just 5 m x 3.5 m internally, this diminutive dwelling was once divided into two rooms (living quarters and sleeping quarters) by a wooden partition that partially remains. Inside there are fireplaces in each gable, with one of the fireplaces hosting a simple stove with primitive oven and a fire crane. The school house went out of use around 1942 with the construction of a new school building on the opposite side of the N4.